Fluxtrol materials are composites made of metal powder and plastic binders, and their machinability is between plastics and metals. Fluxtrol materials are strong in compression with less strength in tension or bending loads. Different grades of Fluxtrol materials require different technique for the best results. Ferrotron 559H is closer to plastics while Fluxtrol A and 100 are more similar to light metals although they are more brittle. General machining practice must be used for different machining operations – blade and band saw cutting, milling, turning, drilling, grinding. CNC machining is recommended. Water jet cutting may be effectively used when possible. For each material it is recommended to establish optimal regimes of machining on samples before producing multiple parts. Handle materials with care. For milling and grinding, the material may be held on magnetic table by magnetic forces. Be careful when clamping material in lathe and vise. Too high applied force can cause marks/defects on the surface the part or even break it. Different grades of metal cutting tools (cutters, mill and drill bits) may be used for machining Fluxtrol materials. High Speed Steel tools give good results. Tools with Tungsten Carbide inserts and tools with TiN or AlTiN coating are the premium cutters with excellent performance. Tools must have sharp cutting edges. 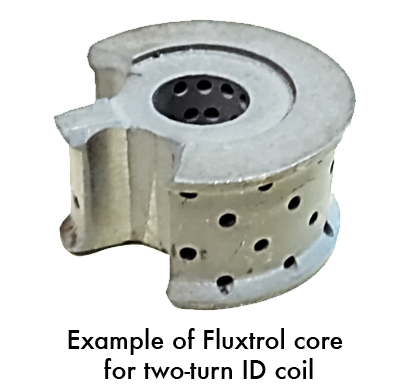 Dull tools will result in slow cutting, material burns and creation of hot chips “sparks” that can ignite smoldering fire in dust collection areas. Though machining may be performed without any cooling, the air cooling of a cutting tool is beneficial allowing the user to increase machining speed and remove chips and dust from the cutting zone. Liquid cooling allows increase of cutting speed and improve surface quality. Control exit of chips or curls from the channels in a drill bit. Back and fourth movement of the tool (plunging) helps you to avoid clogging of channels and damage (breaking) of the part. Pilot hole drilling is strongly recommended for drilling big holes. When using drilling press, install the part on a hard plastic or wooden pad in order to avoid chipping of the edges in the exit area. Check that there is no smoldering of dust in collection tray caused by landing of hot particles (“sparks”). Use sharp cutting tools. Tools with general purpose TiN coating are recommended for long life time. 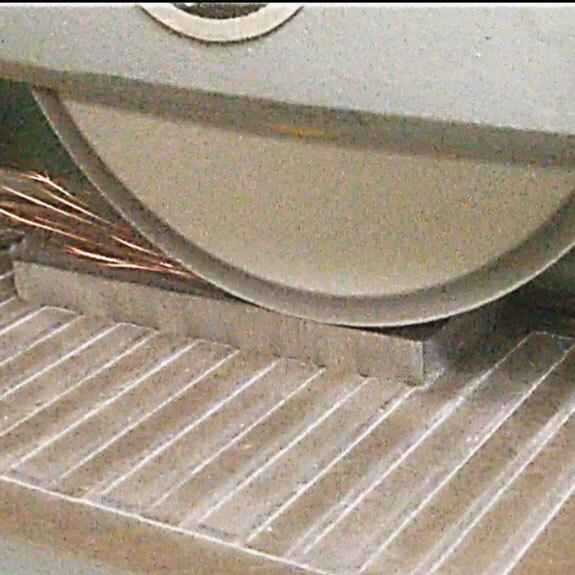 Adjust spindle speed and surface feed rate as needed to prevent chipping. Multiple passes are preferred versus heavy depths of cuts due to the nature of Fluxtrol materials. Plunge milling is recommended for precise machining. Removed material (chips) may be in the form of curls, flakes or dust depending on the material type and operating conditions.